Iran and the nuclear crisis: The clever new sanctions that could cripple Tehran’s economy and rattle its leaders. The clever new sanctions that could cripple Tehran’s economy and rattle its leaders. Iran funnels its energy profits to groups like Hamas. 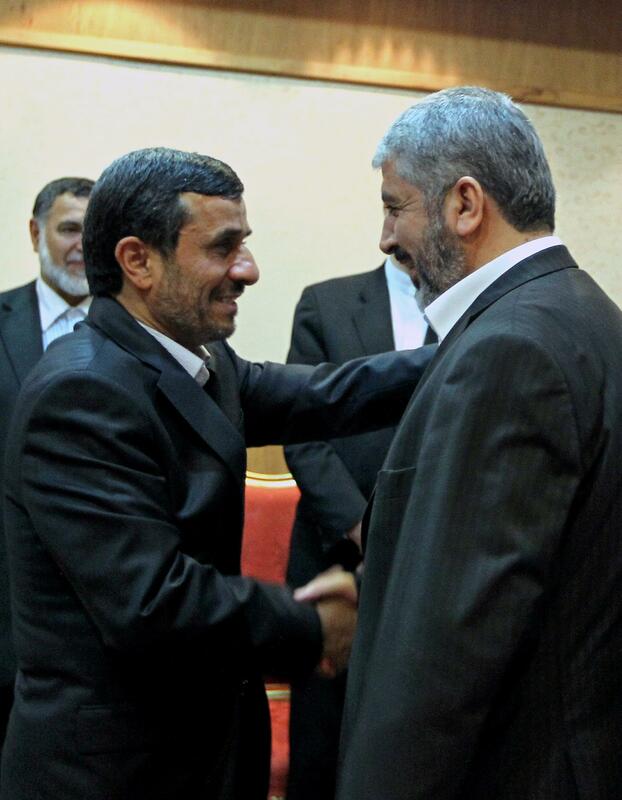 Here Iranian President Mahmud Ahmadinejad shakes hands with Khaled Meshaal, the exiled leader of Hamas. The heavy emphasis on Iran’s nuclear ambitions has diverted international attention from Tehran’s ubiquitous human rights violations. A nuclear-armed Iran would have little reason to heed international pressure over its ongoing repression of women, gays, trade unionists, and religious minorities such as Christians and the Bahai. In recent months, Iran has threatened actress Marzieh Vafamehr with 90 lashes for allegedly violating Iran’s forced dress code, gave 74 lashes to an Iranian student for allegedly “insulting” President Mahmoud Ahmadinejad, and has been pressuring an Iranian Christian pastor to convert to Islam. There’s a temptation for Americans to throw up their hands at these outrages, and assume—since we have already sanctioned Iran and its popular revolt already failed—that there’s nothing that we could do to change it (except possibly bomb its nuclear facilities). But this fatalism and inaction are a mistake. The United States and its allies still have a range of nonviolent options to compel the Iranian regime to pay heed to basic human decency, and reconsider its nuclear pursuits. A potent package of financial sanctions coupled with greater diplomatic isolation and robust support for Iran’s democratic opposition could yet force Iran’s clerical leadership to soften its policies. In late October, David S. Cohen, the Treasury Department’s undersecretary for terrorism and financial intelligence, took a whirlwind tour of Paris, London, Berlin, and Rome in a diplomatic push to convince European capitals to ratchet up their pressure on Iran, in part by isolating Iran’s financial institutions. The most important target should be the Central Bank of Iran, which enables the bulk of Iran’s international trade and energy transactions. To his credit, President Obama implemented strong Iran energy sanctions in 2010, and the 27-member EU largely replicated them. But the Obama administration has not yet used its economic muscle to compel the EU into disrupting the CBI’s operation. The EU and United States have sanctioned a number of Iranian banks—Melli, EIH, and Saderat—for their involvement in the country’s nuclear weapons and ballistic missile programs. Banks Melli and Saderat are subsidiaries of the CBI. But they have not yet sanctioned CBI, the most important bank, partly because Europe has so far declined to help. The EU, now reeling from Greek bailouts and the pending collapse of Prime Minister Silvio Berlusconi’s government in Italy, has shown little desire to extend punishment to CBI. CBI is not the only potential target of sanctions. Total EU-Iran trade surpassed 25 billion euros in 2010, and energy products total 90 percent of Europe’s imports from Iran. The Islamic Republic is the sixth-largest supplier of gas and oil to the 27-member EU. Iran funnels its energy profits into its nuclear program, terror proxies like Hezbollah in Lebanon and Hamas in the Gaza Strip, and the massive security apparatus with which it crushes domestic political dissent. But Iran’s leaders also depend on those profits to line their pockets. European energy sanctions would be a severe blow. There is another potential lever against Iran: EU sanctions against Iran’s Islamic Revolutionary Guard Corps. In 2007, President George W. Bush sanctioned the IRGC—which directs Iran’s terrorist activities from Argentina to Afghanistan—as a global terrorist entity. The EU, particularly Germany, has not done the same. The IRGC controls as much as 75 percent of Iran’s economy, including its nuclear program, and its forces led the crackdown on the pro-democracy Green movement in 2009. European countries could recall their ambassadors to Iran, maintaining low-level diplomatic officials to conduct business. They could restrict Iranian diplomats’ movements abroad, limiting them only to meetings in foreign ministries. Western countries could also provide direct aid to independent trade unions in Iran, including to petrochemical workers who have gone on strike to protest the Iranian regime. These strikes, which call to mind Lech Walesa and the Solidarity movement that broke the Communist regime in Poland, could also play a role in transforming Iranian society. Washington and European capitals have a range of options on Iran. They can do more to isolate Iran’s leaders. They can take action to encourage Iranians who wish to live under a more representative government. But as the Iranian regime continues building a bomb, they cannot do nothing.